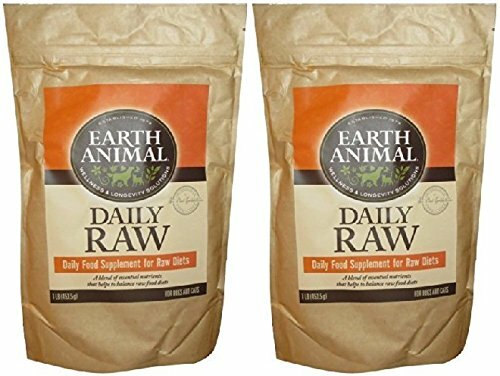 Earth Animal Raw Complete Daily Food Supplement The Skinny on Raw Food Diets - Are Raw Food diets complete? No! Dr. Bob Goldstein has formulated the Daily Raw Complete Powder, a nutritional supplement to add to Raw Meat diets. It is a culmination of essential fatty acids, vitamins, minerals, digestive enzymes, pro-biotics and high levels of Vitamin E that will give the nutrients necessary if you are feeding Raw Food. The benefits of feeding Raw Meat are a healthy skin and coat, cleaner teeth, fresher breath, better weight control, improved digestion, reduction of allergy symptoms, more energy, & increased mobility in older animals.